Non-Destructive Testing Service Market size estimated at USD 3 billion in 2018 and is anticipated to grow at a CAGR of over 6% from 2019 to 2025. The rising expenses and challenges of developing new infrastructural set-up have resulted in the significant aging of the existing infrastructure and led enterprises to look for methods to extend the lifespan of their existing infrastructure. As the existing infrastructure requires comparatively higher levels of maintenance & repair and more frequent & extensive testing services as compared to the new infrastructure, the organizations and public institutions are continuing to invest on various advanced asset protection services to ensure operational & structural integrity of their existing infrastructure. In addition, government have also introduced various guidelines to protect their infrastructure and prevent any catastrophic failure that can cause significant financial and reputational losses. The increasing complexity & automation of NDT services decline in the supply of skilled professionals and increasing number of stringent government regulations have driven numerous companies to outsource their NDT operations to various third-party service providers. The owners and operators are increasingly contracting with third-party providers as they have the necessary technical workforce and engineering expertise to cater to the varying needs of their customers. Outsourcing allows companies to ensure compliance with various safety regulations without incurring any heavy capital expenditure, promoting the use of NDT services. The volumetric inspections segment held over 50% of the revenue in the global non-destructive testing service market in 2018. The use of inferior-grade raw materials and feedstock, particularly in the case of the refining process involving petroleum with higher Sulfur content, can quickly corrode the infrastructure when they come into contact. This will increase the need for volumetric solutions to identify internal defects caused due to corrosion and enable infrastructure proprietors to proactively combat the problems. The increasing use of advanced materials is also supplementing the growth of volumetric inspection market as they are highly-unstable in nature and can cause catastrophic damages to the establishments. The surface inspections segment is predicted to grow at a CAGR of over 6% during the projected time period due to the rising pressure on manufacturing facilities to reduce the number of product surface irregularities. The aerospace industry has also been using surface inspection methodologies for maintenance & repair purposes. Most of the aircraft manufacturers and airlines that perform NDT inspections for in-service aircraft maintenance are witnessing a growing pressure to conduct their assessments in the shortest amount of time, as the longer an aircraft is grounded, the more the air company loses money. This is promoting the use of surface inspection methods in the aviation industry. 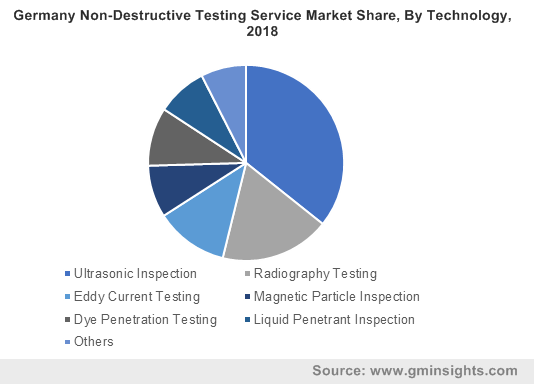 Ultrasonic inspection services dominated the NDT service market with over 30% of the industry share in 2018. The increasing use of portable phased array testing equipment and the requirement of reliable NDT techniques for fiberglass & carbon composites in manufacturing are helping market growth. The infrastructural advancements and automation of various manufacturing plants in the developing countries including India and China have increased the demand for ultrasonic inspection services. The phased array testing market is anticipated to register a high growth rate as it eliminates the need to halt operations caused due to radiation exposure, increasing productivity. The eddy current testing segment in non-destructive testing service market is expected to grow at a CAGR of over 6% during the projected timeframe. Technological advancements in the eddy current testing technology are encouraging its adoption among various industry verticals. The increasing infrastructural development and the introduction of safety regulations by governments in developing nations, including India and China, have enhanced its adoption. It is used in the manufacturing process of several consumer-durable goods and electronic equipment due to the rising awareness of safety and policies by governments. The rapid growth of the power generation industry and the widespread use of various Energy Control Technologies (ECT) in North America and Europe r have also promoted its usage. 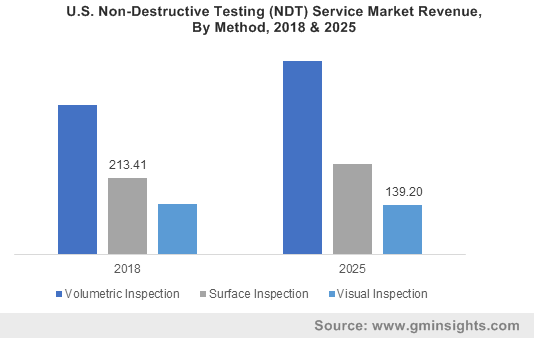 The oil & gas industry accounted for over 25% of the total revenue in the non-destructive testing (NDT) service market in 2018. In the oil & gas industry, safety is of paramount importance to instill confidence & reassurance in various stakeholders associated with the sector due to the highly-unstable nature of raw materials used. NDT inspections are conducted for upstream (explorations/production) operations, midstream (transportation through the pipelines) operations, and downstream (refining) activities. The services ensure the structural & mechanical integrity of offshore structures, such as oil & gas platforms, that need monitoring on a continuous basis to guarantee the safety of the rig’s employees and the aquatic environment. The manufacturing industry is projected to grow at a CAGR of 9% over the forecast timespan. NDT inspection services ensure safe & efficient operations of assets by identifying the detects that could result in catastrophic failures. The services are used to conduct sample or complete examinations of assets and equipment to enable informed asset management decisions. They enable cost-effective operations through fast and effective testing of assets at every stage of their lifespan from manufacturing to onsite operations. The Asia Pacific non-destructive testing service market is anticipated to grow at a CAGR of 10% from 2019 to 2025 due to the increasing number of safety regulations and widespread industrial standardization. The rapid industrialization in various emerging economies has led foreign players to expand their operations in the region to capitalize on its growth opportunities. 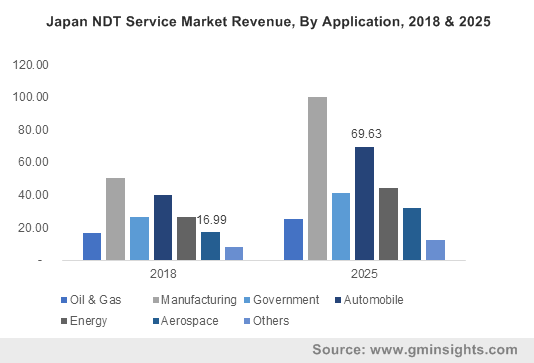 Increasing investments in the defense sector by countries including China, Japan, and India are projected to increase the use of NDT services. The rising use of renewable energy sources and aging infrastructure have opened several avenues for NDT inspection services. The expensive nature of NDT services and the lack of skilled professionals are hindering the penetration of NDT services in the region. 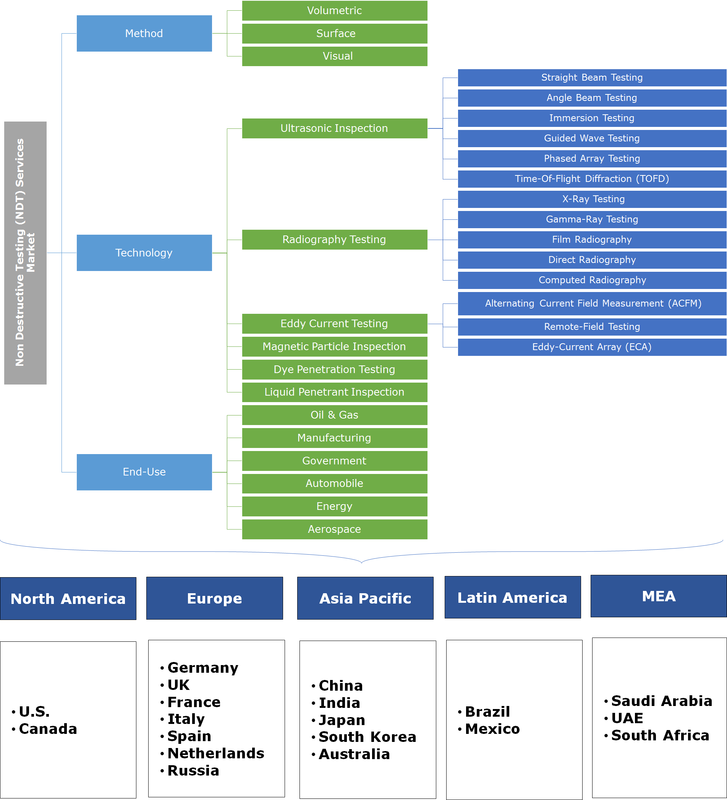 The North America region accounted for over 20% of the share in NDT service market in 2018 due to the introduction of various supportive regulations by the government, mandating companies to use NDT services. The presence of several oil refineries and the increasing domestic production of natural gas & oil have resulted in the widespread adoption of NDT services. The penetration of various advanced technologies across various industry sectors is also promoting the use NDT solutions. In Europe, the non-destructive testing (NDT) service market is led by large players such as SGS, Applus+, Bureau Veritas, and TUV Nord. Large enterprises are conducting acquisitions of regional players and start-ups to expand their geographical reach. For instance, in May 2018, Applus+ acquired KARCO Engineering, LLC., which provides engineering & testing services, mainly in the field of passive safety for the automotive industry. This acquisition will allow the company to expand its geographic presence across North America. The start-ups, on the other hand, are focusing on certain industry sectors to provide personalized NDT services, better position themselves, and compete with large organizations. Some of the players present in the NDT service market include Applus+, TUV Nord, ALS, Bureau Veritas, Dekra, Intertek, MIstras Group, NDT Global, Nikon Metrology, NVI, SGS, TUV Rheinland, and Zetec. NDT services are crucial for ensuring the structural and operational integrity & reliability of the infrastructure without negotiating the usefulness of the tested materials and equipment. The use of NDT services has increased dramatically over the years due to wider industry trends, such as increasing focus on asset utilization & rising desire of infrastructure owners, to increase the usefulness of the existing organizational set-up, new infrastructural projects, and enhanced government regulations. The industry has progressed to a stage where end-users are actively seeking firms that provide NDT services for both in and out service issues.